Rank and Organization: Sergeant First Class, United States Army. For conspicuous gallantry and intrepidity at the risk of his life above and beyond the call of duty: Staff Sergeant Jared C. Monti distinguished himself by acts of gallantry and intrepidity above and beyond the call of duty while serving as a team leader with Headquarters and Headquarters troop, 3rd Squadron, 71st Cavalry Regiment, 3rd Brigade Combat Team, 10th Mountain Division, in connection with combat operations against an enemy in Nuristan Province, Afghanistan, on June 21st, 2006. While Staff Sergeant Monti was leading a mission aimed at gathering intelligence and directing fire against the enemy, his 16-man patrol was attacked by as many as 50 enemy fighters. On the verge of being overrun, Staff Sergeant Monti quickly directed his men to set up a defensive position behind a rock formation. He then called for indirect fire support, accurately targeting the rounds upon the enemy who had closed to within 50 meters of his position. While still directing fire, Staff Sergeant Monti personally engaged the enemy with his rifle and a grenade, successfully disrupting an attempt to flank his patrol. Staff Sergeant Monti then realized that one of his soldiers was lying wounded in the open ground between the advancing enemy and the patrol’s position. With complete disregard for his own safety, Staff Sergeant Monti twice attempted to move from behind the cover of the rocks into the face of relentless enemy fire to rescue his fallen comrade. Determined not to leave his soldier, Staff Sergeant Monti made a third attempt to cross open terrain through intense enemy fire. On this final attempt, he was mortally wounded, sacrificing his own life in an effort to save his fellow soldier. Staff Sergeant Monti’s selfless acts of heroism inspired his patrol to fight off the larger enemy force. 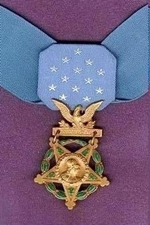 Staff Sergeant Monti’s immeasurable courage and uncommon valor are in keeping with the highest traditions of military service and reflect great credit upon himself, Headquarters and Headquarters Troop, 3rd Squadron, 71st Cavalry Regiment, 3rd Brigade Combat Team, 10th Mountain Division, and the United States Army.